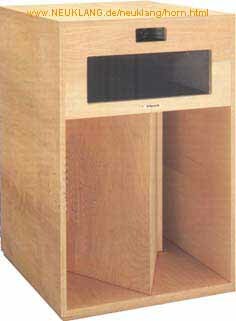 Due a series of posts on a Dutch forum, I remembered an interesting mod to the Klipsch LaScala. This is as good a reason as any to feature the LaScala in itself. It came after the famous Klipschorn and was initially designed as a public adress speaker for an election campaign. It turned out to work well in the home as well, not requiring perfect corners for proper placement. Due to its simplicity, it was also cheaper to manufacture. Of course there is no free lunch, the Klipschorn has lower extension. The LaScala was or is popular amongst first-time horn builders. This is not suprising when comparing the Klipschorn plans and LaScala plans. The LaScala has fewer parts and less extreme cuts. There are several drawings floating around online. There are old drawings in metric measurements from a German source, apparently based on original Klipsch plans. I think I have seen English versions of this as well, in inches. Then there are newer private drawings, made by someone over at the Klipsch board. The Klipsch board keeps rearranging its messages, so my link is dead. They were very nice and insightful drawings, though. When I feel like it, I will dig in deep into the Klipsch archives and find it. The Belle Klipsch is a squished version of the LaScala. It is essentially the same horn, but it is folded into its enclosure differently. As a result, the cabinet is wider and shallower than the LaScala. It makes it easier to place in the home. As I understand, Paul Klipsch recommended it as a centerchannel to use with Klipschorn. Mind that this was as a fill-in between stereo speakers that were spaced too widely apart. This was before surround sound. However, these days the Belle Klipsch is indeed used as a center channel (and surround channels) in surround set-ups with Klipschorns, as is the LaScala. There are private plans of the Belle somewhere at the Klipschboard, if you can find them. Finally, we get to the thing that sparked this post. I read a thread on a Dutch forum about Altec Voice of the Theatre-like (VOTT) enclosures. These have a horn in front of the driver and a bass reflex box on the rear. One remark to another and eventually I remembered an interesting mod to the LaScala. It was pioneered by djk, who hangs out here and there on the usual high efficiency loudspeaker areas online. It assumes that the driver is underutilized by the tuning of the horn and backchamber. By enlarging the backchamber (also known as 'doghouse' in Klipsch designs) and porting it, the cutoff is lowered. Note that this mod essentially turns the LaScala into sort of a VOTT, because the front of the driver is hornloaded and the rear is in a bass reflex box. Great blogg, what type of horn is that on top of Lascala in the bottom picture? I would appretiate some more info as it seems like a really interesting modification..
Hi, the horn on top of it is an Oris horn, from BD-Design. The bass section of the LaScala was popular for use with these midrange/fullrange horns. These days, the designer prefers bass sections that are a bit more like an Altec Voice of the Theater, but with a different driver, different tuning and wildly different construction ad looks. The path difference between bass and the rest was suboptimal. Cool- you used the 3D drawing I made of the ported box to go under the LS. I keep saying I will actually try this, but I'm too lazy to build it. It is a simple box to build, though.